The weather forecast was threatening rain, which was unfortunate given my intentions to see Park Güell today. Nevertheless, I awoke at a relatively respectable hour, pulled on my running shoes and (somewhat amazingly) completed my MPC workout for the day. It was actually quite interesting to go for a run—made one feel a little closer to being a local. It also was just another chance to see an area of the city I hadn’t been in before. It wasn’t a perfect workout (my distance intervals weren’t super precise), but I was pleased to at least have gotten it in. I borrowed one of the B&B’s umbrellas (just in case) and headed off for the day’s adventures. My first stop was actually the Mercado de la Boqueria, This large covered market has its origins dating back to the 1200s, and had been a pig market and then a straw market and a goat market. I love going to markets–even though I typically don’t have any interest in buying anything. Walking by the stalls, seeing their displays, makes me feel, just for a moment, apart of the city…like I am living there and shopping for my daily food. There were an abundance of colourful candied fruit and meat shops. Unlike most markets I’d been to, many of them very handily had small cones filled with an assortment of their product (be it meat or fish or whatever) for people to take with them and eat, and proved a nice way to sample the product. 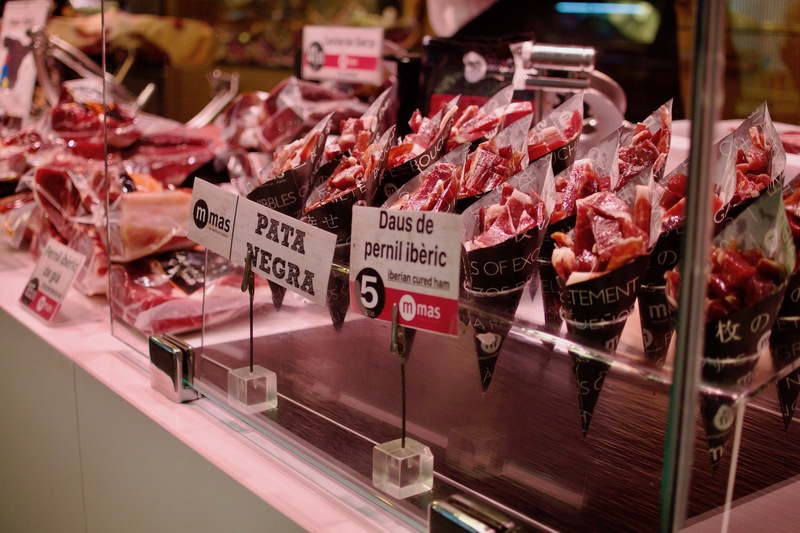 I grabbed myself a cone of manchego cheese and pata negra, both of which were delicious and hit the spot nicely. 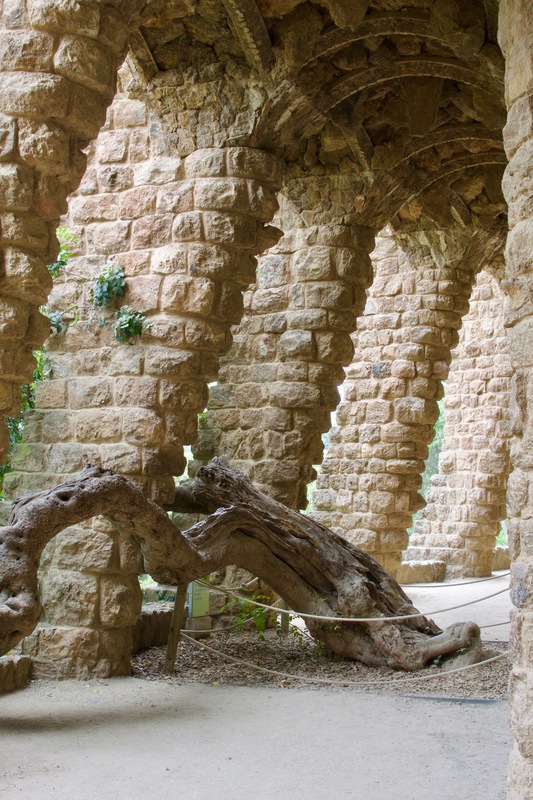 From there, I transited my way over to Park Güell, which was a little ways away from the city centre. To my disappointment, I discovered upon arrival that I should have booked tickets in advance to see the “monument zone”, where Gaudí’s sculptures are held, as the next available showing was a good 6 hours later. 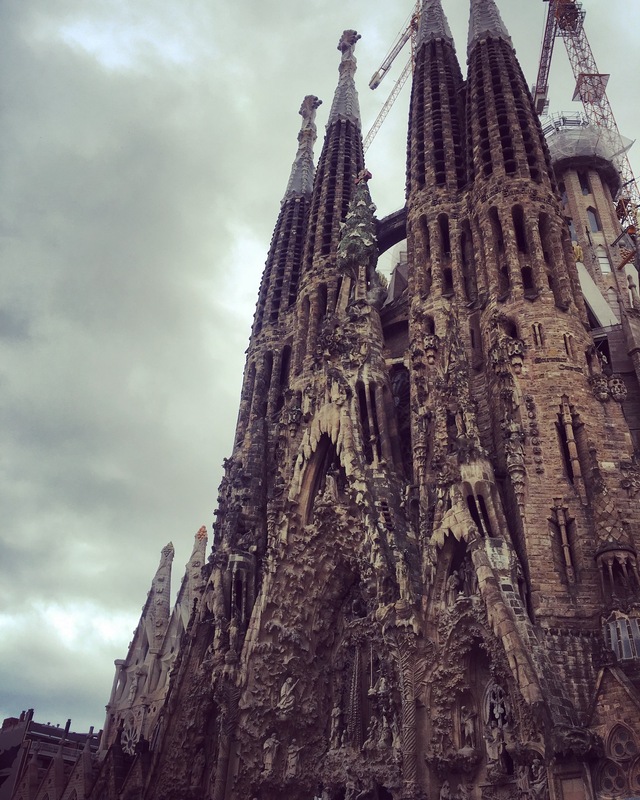 I would’ve come back but I’d already bought a timed ticket for the Sagrada Familia for around the same time. Thankfully, the rest of the park was open and free to the public, so I meandered my way around. The park afforded some panoramic views of the city, though the cloud cover diminished the view somewhat. After I’d had my fill of vegetation, I decided that some tapas was needed. One of my colleagues had recommended a place, Alta Taberna Paco Meralgo, so I hiked on over. The place was still bustling at 3 pm, but I managed to snag a seat at the bar. Requisite glass of cava in hand, I ordered veal carpaccio with foie gras shavings, a melted brie montadito, and (because I physically can’t resist) foie gras on nut bread. 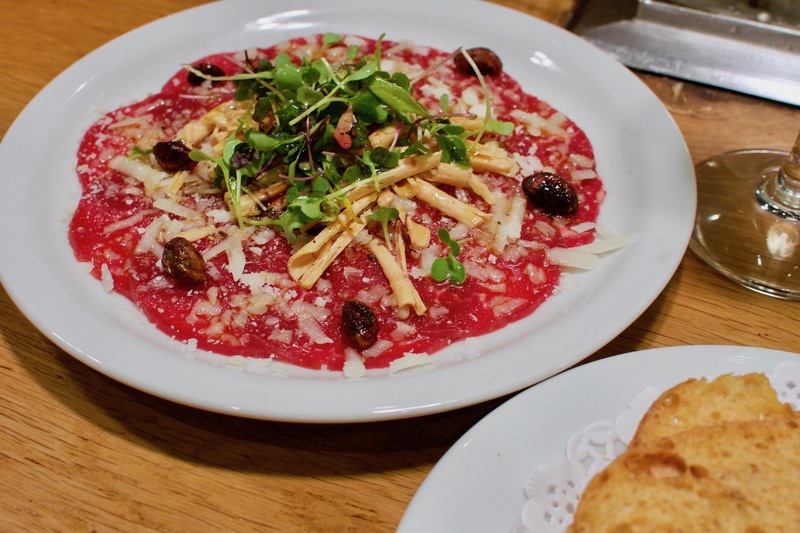 All of it was superbly good–the veal carpaccio was especially tasty–and I once again was in my happy place, ensconced in a veritable bear hug of deliciousness. I chatted with my American neighbours for a time (they celebrate their wedding anniversary every year by coming to Barcelona) and capped off my meal with dessert, a giant profiterole drizzled in warm melted chocolate. I walked back to my B&B to relax and pack things up before my appointment at Sagrada Familia. The church was thankfully quite close to my B&B, so it wasn’t long before I was gazing up at the striking insanity that is Antoni Gaudí’s unfinished masterpiece. When he died in 1926, the building was not even a quarter finished, and the expected finish date is projected to be 2026. Its facade is incredibly ornate, intricate carvings covering its entire surface. I wasn’t sure what I was expecting upon entering, but its interior is no less breathtaking. 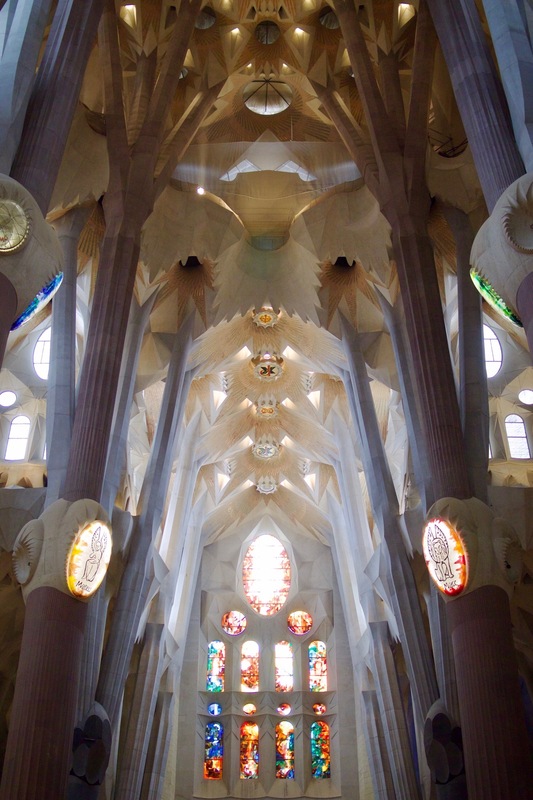 I’ve always thought that the giant pillars inside cathedrals look something like tree trunks, but apparently Gaudí intended the pillars to really look like trees, branching off dramatically at the ceiling. The rainbow of stained glass windows cast beautiful colours onto the stone. The place was packed, which wasn’t surprising given that it’s apparently the most visited monument in Spain. But the nice thing about its massive size is that you don’t really notice the crowds–that and you’re always craning upwards at the ceiling, so the buzz of the tourists sort of dies away. I don’t think I’d ever been in a church quite like this one–something so modern and avant-garde. I loved how different it was to anything I’d ever seen. I had also bought a ticket to go up one of the towers, so I waited in line for the elevator (which you only took up. You had to walk back down the 400 or so steps). You were let out onto a very small bridge area and peered through the metal bars to glimpse at the city and the construction being done on the church. It was actually more interesting going down the spiral staircase, peeking out the windows on the way down. After lingering outside, staring up in awe–there’s just so much going on, it’s hard to take it all in–I made my way to the metro and headed off. 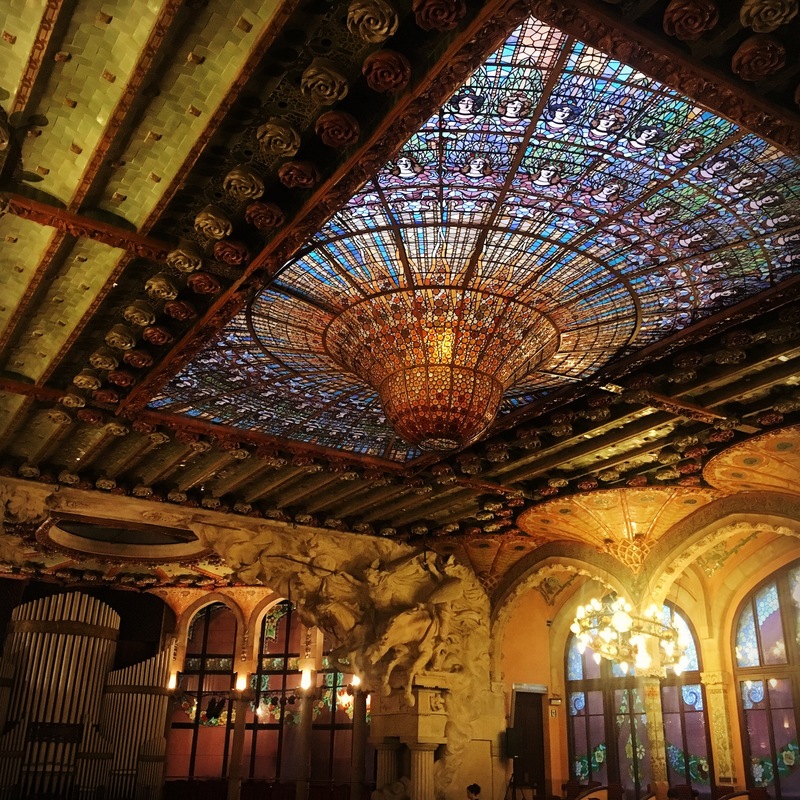 My sister, being the stained glass aficionado that she is, recommended that I check out the Palau de la Música Catalana, as it apparently has a pretty epic stained glass ceiling. As it was a somewhat spur of the moment stop, I hadn’t done much research on it, so I when I arrived I learned that guided tours of the place ended several hours earlier. I was feeling determined/spontaneous, so I decided what better way to see a theatre hall than to see a show. There was a showing of Gran Gala Flamenco later that evening which seemed like the perfect opportunity, plus music and dance–two of my favourite things! I needed to eat something for dinner, so I checked out one of the recommended spots on my food list, El Xampanayet in the Gothic Quarter, which opened in 1929. The tiny place was packed, and I squeezed my way into a spot at the bar. One definitely had to jostle to maintain one’s position. They’re known for their cava, and I probably downed three delicious glasses in less than an hour (’tis the danger of cava). I enjoyed my tapas–salmon, bacon, Spanish omelette, all good things–before heading back up to the B&B. I didn’t have my glasses on me, which I would need to be able to see the show. I took the opportunity to change into something a little more “going to the theatre” before bolting back out the door. I’d read that Palau de la Música Catalana is considered to be one of the most beautiful concert halls in the world. I’d have to say I’d concur with that assessment. It is truly breathtaking upon entering–you can’t help but just gape at the gorgeous stained glass ceiling and windows that line the hall, along with dramatic carvings emerging from each corner. I was giddy at the sight, pleased at my spontaneous decision to see a show and the inside of the theatre. The performance itself was great–fantastic dancers and musicians. The show was marred only by the pair of people sitting in front of me who were quite restless (I think because of the heat), and would often make it hard to see. Nevertheless, I’d never seen flamenco dance in person, and I was captivated. Speed and sass! The speed of their footwork, which reminded me a bit of certain moves of tap dancing, was amazing. As I always seem to after seeing a new dance style, I found myself wanting to learn its secrets and try it for myself. Next time I’m in Spain! Gracias Barcelona, you treated me well.